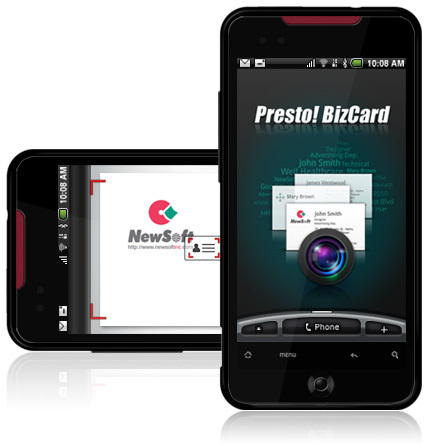 Presto!BizCard is the best all-in-one business card app. It offers you a quick and convenient way to scan and add your business cards directly into your phone using the most accurate OCR technology available. Simply take a picture of your business card or select form your phone library, BizCard lets you to effortlessly store and manage your business cards on your Android phone. Between swiping through your business card images or from text mode, you can easily find the right contacts at your finger tip. No mater making calls, texting, browsing the contacts or surfing the web, the advanced business card management system provides many ways to make your life easier. In addition, Presto! BizCard allows you export contacts to Google Contacts and SalesForce and also includes all the more advanced and easy to use features listed below. Copyright © 2010, NewSoft Technology Corporation. All right Reserved.